Who doesn’t walks on the beach and cycling through the long summer evening however with them come the wind and humidity which can cause hair to get dry, parched and consequently tangled. There are ways to avoid looking like a mess and instead flaunting effortless beach waves this season with our savvy Summer Hair tips & tricks. The tangle teaser is just another hair brush but is specifically created by a British Hairstylist in response to a number of complaints from his clients who were tired with their hair tangling constantly. Particularly beneficial for those with thick, coarse, curly or wavy hair, this palm sized hair brush with short spiky bristles dissolves knots in seconds minus all the pulling, tugging and hair loss. It’s dinky size makes it a handbag staple for the hotter months. Getting a trim sounds like an obvious one but you’ll be surprised to know how many people ignore this tip. Come Summer, or change of any season that is usually thrice a year, it is inevitable to switch up your hair and if you’re not that experimental to play with seasonal hair styles, at least opting for a good old trim. Defined layers, no split ends and clean edges will automatically prevent hair tangling. A Brazilian Blowdry injects the much needed moisture into your locks making them smooth, frizz free and glossy. It repairs damaged hair, replenishes the level of keratin in the hair needed for healthy, luscious locks and makes hair manageable and frizz free. Perfect if you’re a frizz ball in the warmer months and want to wake up with softer, tame hair every Summer morning. Bliss! Leave in conditioners are available in abundance in the market in liquid, cream and spray formulas are a treat to drench your hair into after a hairwash or even on an everyday basis. Most formulas these days are non-sticky and they don’t weigh hair down meaning you can spray as liberally as required. Of course conditioning hair in the shower is a must but that’s not enough hydration for hair in the Summer when the sun and the heat dries it out. Not only are leave in conditioners great moisturisers for the hair, hydrated silky hair is less likely to tangle. 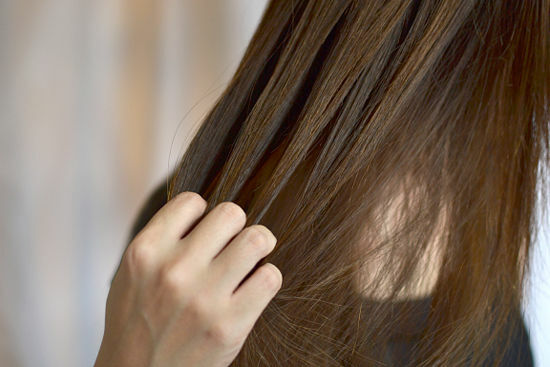 Permanent Straightening is a hair retexturising treatment originating from Asia and provides poker straight hair for three to six months, leaving you carefree for the summer. If you have particularly wavy or curly hair, it can also act as a completely new hair style for the new season allowing you to feel fresh and young. Moreover, silky straight hair achieved after this treatment is more likely to be flowy in texture be it rain or shine, much less likely to be affected by the weather hence leaving you tangle free.